Knowing where to focus your social media efforts usually means going through a process of hits and misses, so to give you the best chance of getting it right first time, we have put together all of the key information you’ll need for each platform. In this blog, we will help you figure out where you need to be to reach your ideal audiences and will offer you some direction in how you could be using your content to tap into the scrolling habits of your audiences on each platform too. The original king of social media was Facebook. They are an all-rounder; whether your audience are in their teens, 20s, 40s or even 80s, Facebook is somewhere you will likely find them. It boasts 2.07 billion monthly active users worldwide, making it the most widely used platform out there. It will be useful to remember though that Facebook is largely seen as an ‘older’ ‘less cool’ platform than some of the others out there. The biggest age group on Facebook in the US is now 25-29 year olds, 82% of internet users in this bracket are on Facebook. A study by eMarketer expects the number of Facebook users aged 12-17 and 18- 24 to decrease by 5.6% and 5.8% this year; this is a disaster for them and they’ll be doing their utmost to bring these users back in and change their perception that Facebook is an outdated platform. But, they don’t have too much to worry about just yet as their user base is still continuing to grow amongst the older generations. Meanwhile, in other demographic data, the gender split on Facebook is pretty equal, users are more likely to be university educated than not and it truly is an international, multilingual community. But what do people use Facebook for? Well, the first is for events. 62% of respondents in a StubHub survey had used Facebook to learn about a live event, more than any other social network. The second is for shopping. Data released by Facebook itself said that 46% of their users across six countries have found fashion inspiration on the network in the last three months, which may have lead to a purchase, which is particularly interesting if your this is your kind of brand. The last area in which Facebook really thrives is in news, Pew Research found that nearly half of US adults use the platform for this reason. Then there is Instagram, which has recently skyrocketed in popularity and very recently hit 1 billion monthly users. In the US, 64% of internet users between the ages of 18 and 29 use Instagram and 40% of internet users between the ages of 30 and 49 use it. Instagram drives the most engagement per post compared to any other social network - that is 84 times more than Twitter and 10 times more than Facebook. For the right brands, Instagram is a gold mine, where currently 7 out every 10 hashtags are branded and 80% of users follow one or more business accounts. The most staggering stat of all for marketers is that at least 30% of Instagram users are thought to have made a purchase after discovering a product on the app. Its multimodality of videos and photos makes it the perfect platform to get creative with your content! YouTube, on the other hand, has 1.57 billion monthly active users and 5 billion + videos shared to date. In terms of age demographics, 94% of 18-24 year-olds in the U.S. use YouTube whilst 68% of those aged 50-64 use it, so it’s pretty popular for every generation. Across the world in a single day, we watch 1 billion hours of YouTube. That’s right, 1 billion! YouTube is one of the largest search engines in the world and it’s the second most visited website after Google. YouTube allows businesses to create TrueView ads (the skippable adverts at the beginning of a video), their own data has shown that viewers who watched these video ads to completion (or at least to 30 seconds) were 23x more likely to visit or subscribe to a brand channel, watch more by that brand, or share the brand video, whilst viewers who were just ‘exposed’ to TrueView ads were 10x more likely to take one of those actions. The potential reach on Youtube is vast, so if the shoe fits then take the leap! Our favourite opinion orientated platform, Twitter, has 330 million monthly active users and they support over 40 languages. Similar to Facebook, the gender split is even and users are more likely to be university educated than not. In terms of age demographics, the biggest age groups on Twitter are 18-29-year-olds (40% of internet users in this group) and 30-49 yo (27% of internet users in this group). It’s a platform used all day every day. Twitter’s head office themselves aren’t sure how many tweets go out a day, 3 years ago they stated 500 million Tweets are posted daily, but now there’s so many that they just refer to the number as ‘hundreds of millions’. For businesses on this conversational platform, one of the biggest reasons to use the platform is to improve the speed and quality of their customer services, big brands like Tesco and Netflix offer exceptional and very human customer service through Twitter where they give real responses, often injecting humour into their replies, so if you are a conversational company with close ties to your customer base then you will definitely benefit from using Twitter. The biggest reasons other people use the site is for news and according to Twitter, “to discover something new and interesting”. This is something to remember when deciding whether to use Twitter for your company and then in planning your Twitter content. 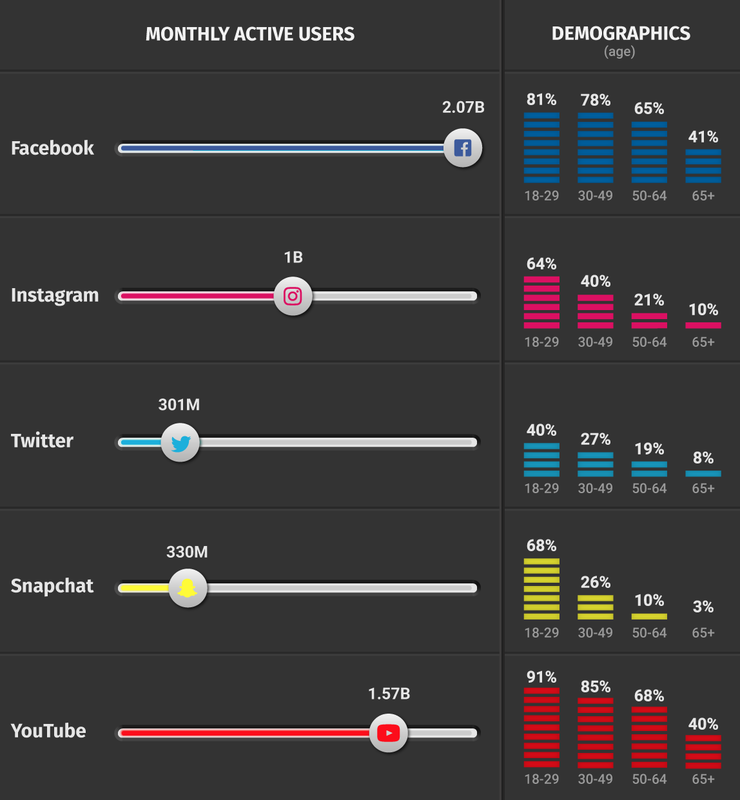 Snapchat is the smallest of these platforms and is mostly used for messaging, it also takes the prize for the biggest proportion of young users. An impressive 60% of its users are under 25 years old, this figure rises to 77% in the UK. Its number of average monthly active users currently stands at 301 million. Just a couple of months ago Snapchat suffered major damage after huge stars like Kylie Jenner and Rihanna publicly shamed and deleted their accounts on the app, whilst poor app upgrades were driving people away in their thousands, Snapchat seemed to be on the way out. Luckily for them, they seem to have picked things back up again. It’s thought that around 43% of social media users will use Snapchat this year. Snapchat’s youthful user base may be one of the reasons it’s been so ahead in coming up with fresh new features that their rivals jump at when they have the chance, including stories and interactive augmented reality camera features, both of which have been copied by Facebook and Instagram. Targeting your content towards the right audience and on the right platforms will be more effective than being swayed by an array of flashy features. Find out where you need to be and focus your efforts there for the best chance of reaching your social media goals. Talk is cheap, or so the saying goes, but what is the real value of conversation in the digital age?